Jam Sebastian of the famous YouTube love team Jamich looks skinny in a recent photo with his real-life partner Paolinne Michelle Liggayu. In his Facebook post on Saturday night, November 8, Jam said he misses those moments when he and Mich go outdoors and snap photos. Jam's latest stills with Mich were taken from a balcony overlooking the waters and greeneries at Pico de Loro during a vacation. He complained that he wasn't able to roam around the beach resort which is located in Nasugbu, Batangas. The internet sensation shared that he only forced himself to stand up and pose for the pictures as he easily gets tired and finds himself gasping for air if he moves around even for a short period. "Sobrang miss na maging normal. 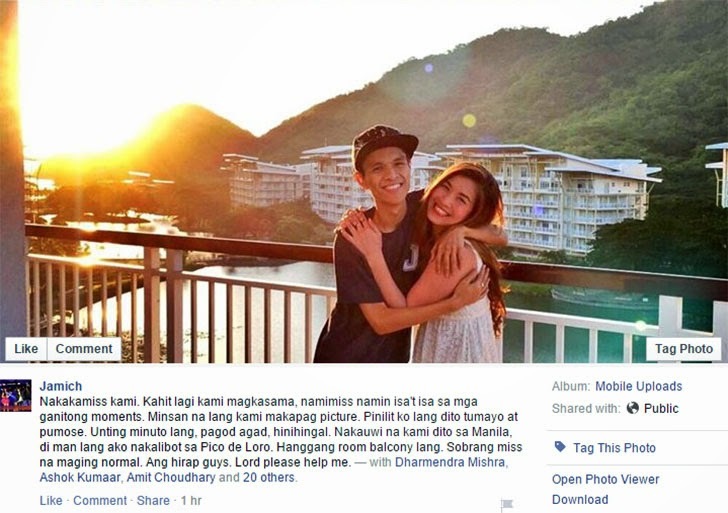 Ang hirap guys," said the other half of the Youtube duo as he continues his battle with stage-4 lung cancer. "Lord please help me," he posted.